You are going to have to forgive me if this week’s Saints Speak message is a little bit uncomfortable for me. While I love all of the different parts of my job as a principal, one of the most difficult things to do is to discuss or ask for money. Today, my Saints Speak focus is on the ASCA Annual Fund Appeal. First, I would like to take this opportunity to thank all of our school families who have already made a contribution to the appeal by check, or by going online to Click and Pledge to make your donation electronically. We are grateful for your generosity and your trust in All Saints Catholic Academy. I would like to share some information with you about the role and importance of the Annual Fund Appeal in the finances of ASCA. The appeal is a part of the operating budget of All Saints, and provides financial support that allows us to continue to offer an excellent education to our students that is grounded in faith, with small class sizes, and affordable tuition. You may not be aware of the fact that All Saints has not raised tuition rates for the past three years. This is one of the major benefits realized from the monies that have been collected from the Annual Fund Appeal. They have helped us to hold the line on tuition increases. This is a positive outcome that touches all school families. Gifts to the ASCA Annual Fund Appeal create one of the school’s most significant sources of income and support. All Catholic schools – elementary, secondary and colleges/universities have annual funds. Because annual fund gifts are unrestricted, they can be directed to the most impactful areas of need in a school. Annual fund donations are flexible, and can be immediately transformative for a school in so many ways -in curriculum needs and programming, and even expenditures like text book purchases, which can be quite significant in the years that they are refreshed (just to name a few). A year ago, we purchased new science textbooks at ASCA. This year, we purchased new social studies texts. Next year, we plan to replace Religion and Spanish books. Each gift, no matter how large or small, strengthens our community and the school's participation rate in the appeal, demonstrates your deposit of faith in ASCA, and exhibits how much you value an All Saints Catholic Academy education. A number of our school parents have also gone above and beyond in their annual fund appeal donation by initiating a matching gift from their employer, making their donation to All Saints go even further. Many employers sponsor matching gift programs and will match any charitable contributions made by their employees. If your donation is eligible for a matching gift, we encourage you to fill out your company's online form, or request a form and send the completed form to All Saints. We will verify your gift, and submit the form or appropriate paperwork to your company. I am aware that many of us are feeling a little bit of donor fatigue at this point of the year. We have just moved out of the Christmas season, and the Dinner Dance Auction (ASCA’s biggest fundraiser) is just around the corner, which we hope that everyone will not only attend, but generously support. The Annual Fund Appeal may not be the most dazzling or ‘appealing’ option to give to; but collectively, monies that are donated to the Annual Fund Appeal have the power to give back to our students and families in so many different ways. You can be confident that your gift will make a profound difference in the life of each student, staff member, and family at All Saints Catholic Academy. Knowing this, I am asking each one of you to contribute to this year’s appeal with a gift that comes from your heart, from your budget, and from your belief in all of the wonderful things that are happening at All Saints. It is safe and easy to make your donation online. It will only take a few minutes of your time. Simply click here to make your online donation to the ASCA Annual Fund Appeal today. I know that each one of us makes choices each day in how we spend our money, and where our priorities lie. I thank you for your belief in me, in our leadership and direction, and in our amazing school. All of our current families are invited to join us at this year’s Open House on Sunday, January 27 from 1 – 3 pm. There will be all kinds of excitement going on in each classroom. Come Enjoy the Open House - All families who attend the Open House, and complete the Open House Scavenger Hunt will be entered in a drawing to win their re-enrollment/registration fee for the 2019-2020 school year. Refer a family to All Saints – invite someone new to find out more about All Saints, and potentially earn a referral credit toward your 2019-2020 FFO. Click here for more information. Volunteer to give a tour – share your love for ASCA by giving a tour to potential new families. Take part in the Knight of Columbus Free Throw Contest – it will be taking place in the ACSA gym on Open House day. Check in is at Noon. Everyone can Help Us Advertise the Open House - and earn an Out of Uniform Pass for your student(s). 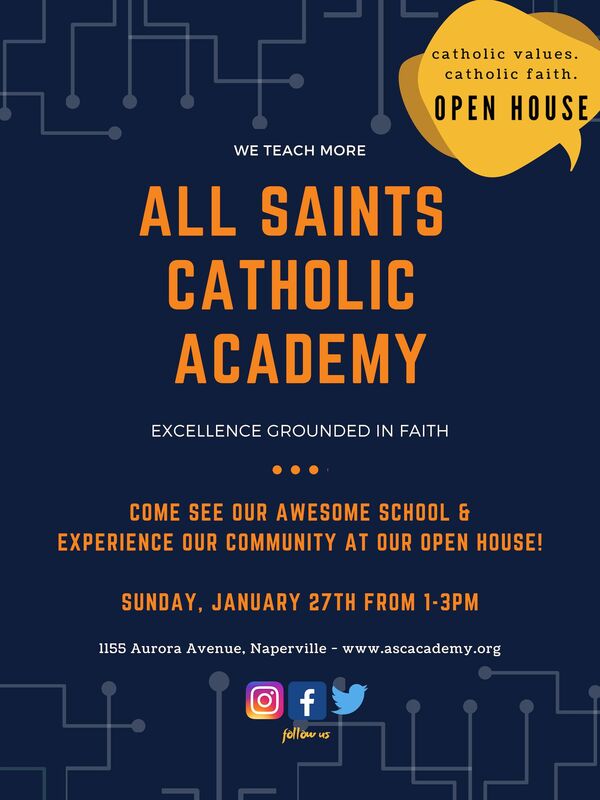 Please help us SHARE THE GOOD WORD about our upcoming open house on Sunday, January 27th from 1:00 - 3:00 pm. Doing so can earn your student an out of uniform pass! Students/parents must post the ad between today and Saturday, January 26 to get the out of uniform pass. Either a screen print of the post or a picture of the flyer hanging up must be emailed to socialmedia@ascacademy.org by 1/26, along with the student's name(s) and homeroom teachers. Parents should title the email "Open House Ad". We need your help to get the word out. Thanks in advance! The electronic re-enrollment email to current school families for the 2019-2020 school year will be sent tomorrow Friday, January 18. Additional details will be sent prior to the re-enrollment email via SchoolSpeak to guide you through the process. Successful re-enrollment by the deadline, and a current student account will guarantee your student’s spot for next school year. If your account is not current, please contact the office to put a payment plan in place. Families that do not re-enroll by 3:30 pm on Friday, January 25 will have their student’s spot released for new family enrollment. New family enrollment opens on Sunday, January 27. The current family re-enrollment fee is $200 per family. This fee will be charged to all re-enrolled families via their FACTS account, and will be due within 10 days of billing/invoice. If you have any questions about the re-enrollment process, please contact Patty Bajek at pbajek@ascascademy.org or (630) 961-6125. All Saints completed their 2nd test of the Nixle Emergency System last Friday, January 11 at 7 pm. If you did not receive this test notification via phone, text and/or email, please let us know. The Nixle system will now be used for calendar reminders. Unlike the Emergency System where all families receive notifications, families will have to ‘opt in’ to receive calendar reminders via text (no phone or email). Please look for our inaugural text coming shortly – and opt in to receive future calendar reminders. Find out more about what happened at ASCA this past week by tuning into the ASCA NOW News, produced by our Junior High Academy Grade 8 Honors ELA students. What an amazing job! 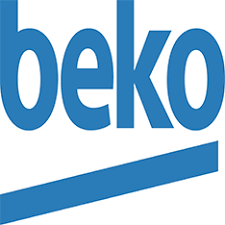 Click here to view this week's news. February Hot Lunch Orders will be accepted through Tuesday, January 22. Be the point person to help communicate between school and our studio. Help gather pictures! 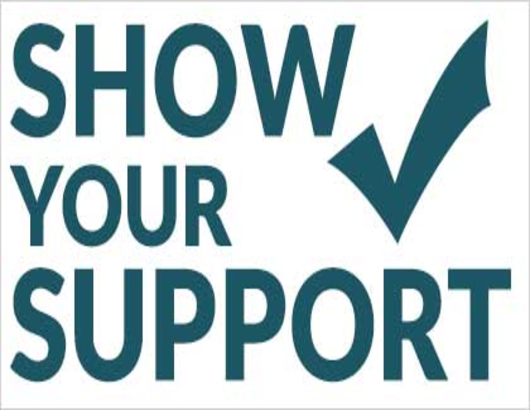 We need you to reach out to those people (teachers and parents) that like to take photos at events, during assemblies and around school and ask them to share their photos with us. Help with organizing the cover contest. We will give you all the information about how to run it. You would get the word out and collect the entries, then get the teachers/staff to vote. Gather the 8th grade “quotes” from their teacher and send those to us. Total commitment would be several hours over the next few months. There will be a meeting/workshop after school on Wednesday, January 23 from 3:30- 5:00 pm in McSherry Hall for all 5th, 6th, 7th and 8th graders interested in learning more about the 2019 All Saints Musical. More details coming soon! Sign up your K-2 student for this afterschool program where students will explore challenges facing today's scientists. Teams will be formed that will participate in a non-competitive Expo to take place on April 6 (this is optional) Class takes place on Tuesday afternoons from 3:35-4:35 pm, and begins on Tuesday, January 29. This session's theme is Mission Moon. Click here to register. Join our new friends every Friday that school is in session from 9 – 10 am for our Parent (Caregiver) and Tot Group at All Saints, geared to connect our youngest saints who are not yet ready or age appropriate for preschool and their parent/caregivers with each other here at ASCA in Room 108. Check in at Door 1, and join the fun! Our next meeting is tomorrow Friday, January 18 at 9 am. Martin Luther King, Jr. was deeply committed to serving others. Each year on MLK Day, the students of ASCA honor Dr. King through acts of service. School is not in session on MLK day. Instead, students are asked to perform an act of service. This Day of Service is about giving of yourself for the benefit of others. Your act of service should be directed toward the greater community. It should not be an act of service for your parents or grandparents; because helping them is something that you should always do. Additionally, it is incredibly important to reflect on how the activity has impacted you. Each student should fill out a Reflection Form on the service they completed. The completed form should be submitted to their classroom teacher on or before Friday, February 1, 2019. SHPP’s Community Outreach Committee has scheduled multiple service activities for your convenience. These activities and the related signup links can be found in the list below. Many of you have signed up for these opportunities - THANK YOU! There are still spots available helping with the Parish Cleanup at St. Margaret Mary as well as openings making cards at ASCA for the Caring Cards Ministry at St. Elizabeth Seton Church. For those of you who are still looking for a volunteer opportunity, you are not limited to this list, as you can feel free to create and complete your own act of service. For example, you may choose to help a neighbor with chores, write a letter to a senior citizen, and/or volunteer with your family at an organization close to your heart. With the snowfall that is expected this weekend, if you are able and with your parent's permission, you might choose to help a neighbor by clearing their walkway. For our youngest preschool saints, we encourage you to create or take part in an age appropriate act of service to start planting the seeds of service;. For preschoolers only, it is not required, but optional. For parents looking for an activity that can be done at home: Operation Support Our Troops (OSOT), which is based in Naperville, provides support for our active duty military. Students (and parents!) can write letters of encouragement to our troops. See their website for further information: http://www.osotamerica.org/get-involved/become-a-member/ Please contact Robin Beck at robindbeck24@gmail.com with any questions. The community service activity can be completed any time during the month of January to allow families to complete community service opportunities in a way that works for them. We encourage you to find an activity that matches your passion and participate wholeheartedly. The reflection forms that we have received in the past have demonstrated how much serving others makes us feel good, and grows our kind and compassionate hearts into wanting to help others more and more. We would love to share pictures of our students in service! Please feel free to send pictures of your student doing service for MLK Day to Robin Beck at robindbeck24@gmail.com. We hope to share these photos with our school community to celebrate our Saints in Service! Students are not in school (it is a non-attendance day). Students and their family are performing acts of service in the community. Students are required to fill out and turn in a Reflection Form about their act of service by the Friday, February 1 deadline. Students who do not turn in a Reflection Form by the deadline will be marked absent for the day. Click here for the Reflection Form. Although students are not in school on Monday, January 21, this day is included in our total attendance days that are reported to and required by the State of Illinois. If your K-8 student does not turn in their Reflection Form by the February 1st deadline, they will be marked absent for the day. FOUR SESSIONS: LIMITED SPOTS AVAILABLE FOR SATURDAY, 1/19 2:00 - 4:00PM SESSION ONLY! Once these are filled, there is no further availability. Description: ASCA volunteers assist the parish by cleaning pews and vacuuming the church. Description: ASCA volunteers make uplifting and prayerful cards for parishioners and/or their loved ones who are chronically ill, elderly/lonely, or recently widowed. Cards will be sent monthly and all information is kept confidential. Our goal is 200 cards filled with Valentine’s Day and Spring themed cards. Be creative and have fun while helping others in our community! All ages are welcome! THIS VOLUNTEER OPPORTUNITY IS FULL. NO FURTHER OPENINGS ARE AVAILABLE. Session: 10AM - 11AM for 14 student volunteers (not including parents) Please note the time change! Remember - each student must complete and return the Reflection Form to their classroom teacher by Friday, February 1, 2019 in order to receive credit for attendance on MLK Day. Please click here for the Reflection Form . A copy of the Reflection Form was sent home in hard copy with ALL students last week. *Please note that Benedictine University will not be offering their Day of Service to the community, as they have in previous years. We know that many of you chose to participate in this annual event, and we wanted to make you aware of their schedule change. Their Day of Service on 1/19/19 is for their students only. LAST CHANCE to order your Fun Fair T-Shirt. Deadline has been extended to tomorrow FRIDAY, January 18. Orders must be received by 3:30 pm! The fun fair is one of the biggest fundraisers for the 8th grade class trip for the ASCA Class of 2020. Students who purchase the 2019 Fun Fair T-shirt will be able to have a dress down day and wear their t-shirt to school on Friday, February 1st. On Friday, February 1, only students who have purchased the 2019 Fun Fair t-shirt will be able to be out of uniform. It is NOT a 'Spiritwear Friday'. It is NOT a 'wear a Fun Fair t-shirt from a year other than 2019 day'. It is NOT a 'use an out of uniform pass from my birthday or other out of uniform pass day'. Students who DID NOT PURCHASE the 2019 Fun Fair t-shirt will be expected TO BE IN UNIFORM on Friday, February 1. Only students are required to purchase a wristband. Parents are welcome to accompany their student to the fun fair, and do not have to purchase a wristband. The family max amount only takes into account the number of students who will be attending the Fun Fair. If you overpaid, it has been noted, and a refund will be coming your way. So come on out of the cold on Friday, February 1, and LET’S HAVE SOME FUN! 5:30 – 6 pm: Early Bird Entry for Preschool/Kindergarten ONLY. Our youngest saints have the whole fair to themselves! Come One, Come All! It's time to sign up for Fun Fair. The Class of 2020 can't wait to see you there! Please return your order form and payment as soon as possible. The hard deadline for the t-shirts is tomorrow Friday, January 18th at 3:30 PM; we cannot accept any orders after that date. There will be a limited amount of shirts available for purchase at the Fair in limited sizes. Click here to place your 2019 Fun Fair order online. We are in need of donations for the always popular Soda Pop Toss and Cake Walk. Please contribute if you are able. All flavors of soda in 2 liter bottles and all types of baked goods are welcome. Soda bottles can be dropped off at Door 1 Welcome Desk from January 28-31st. Baked goods can be dropped off January 31st-February 1st, also at Door 1 Welcome Desk. Thank you in advance for your help in making the Fun Fair a success! 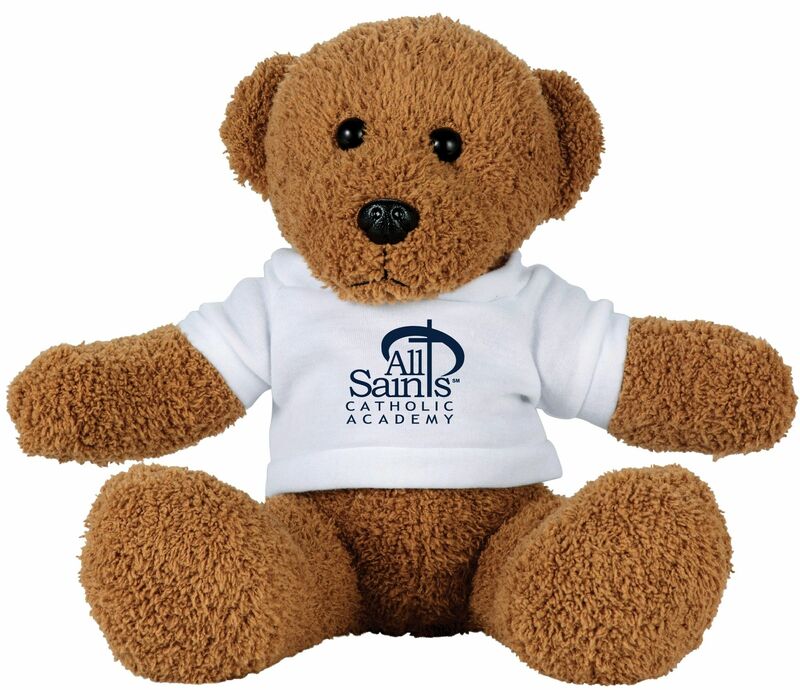 Limited Edition ASCA TEDDY BEARS - Grades Pre-K thru 3rd can have Teddy Bears as Desk Buddies during Catholic School Week! SAINTS SALON – Sponsored by SOLAIA Luxury Salon & Spa. THIS IS AVAILABLE FOR PURCHASE ONLY AT CHECK-IN DURING FUN FAIR DUE TO VERY LIMITED SPOTS AVAILABLE! Stuffed Animal Raffle – check out the signs throughout the school to see the adorable and very large stuffed animals being raffled. To redeem, simply mention ASCA Fun Fair. All of these specials expire APRIL 1st, 2019. Invitations for All Saints’ 14th Annual DDA are coming home with youngest and only students via backpack mail TODAY! Be sure to make sure you receive yours (contact the School Office if you need another copy), and RSVP by the Early Bird deadline of next Friday, January 25th for special reduced ticket pricing. For more detail about the event, including menu offerings and an event FAQ, visit the event site at www.ascadda.org. Saintly Spots and Program Ads are a terrific way to advertise your business or to celebrate your child’s graduation, First Communion, sports team or scout troop. Place a photo of your child’s band, choir or school musical participation. Saintly Spot ads are also featured on the ASCA TV in the main floor hallway – students truly love seeing their accomplishments being recognized by the school. Program Ad/Saintly Spot Ad submissions are due no later than TOMMOROW, January 18th. Click here for the Saintly Spot form. Click here for the Ad form. Tuition Credit Raffle Tickets are Going, Going...Almost Gone! Less than 30 remain! For only $100 per ticket you have the chance to win $5,000 toward your 2019-2020 tuition. Only 150 tickets will be sold and less than 30 remain! DDA volunteers are available for ticket sales after Mass each week or you can purchase your ticket online at www.ascadda.org. Forms are also available at the Welcome Desk. Cash, Check (payable to ASCA) or FACTS (must be set up for auto-pay) will be accepted. All Saints has been able to secure a special DDA booking price at Hotel Indigo in Naperville of just $119 at this beautiful boutique hotel. Hotel Indigo maybe able to arrange free shuttle service to and from All Saints throughout the night. When is the last time you enjoyed a little getaway while supporting such an amazing cause? To make your reservation contact Hotel Indigo at (630) 778-9676 or use this link – click here - and then click the Book Now box. Scrip – orders are placed each week. Orders made through the end of February will count toward the 2018-2019 FFO. Orders placed after February count toward your 2019-2020 FFO. Using Scrip is a GREAT WAY to purchase your Christmas gifts and other holiday needs, and earn money toward your FFO. Questions about getting started with Scrip? Contact scrip@ascacademy.org. DDA donations - item donations – FINAL DEADLINE is tomorrow, Friday, January 18! See the DDA Forms Finder for more information. Note – ticket/raffle purchases do not count toward the FFO. If you are interested in volunteering to prepare a meal, please sign up at https://www.signupgenius.com/go/20f0d45a5ad28a20-tecault. This week’s YOGURT BEACH Home Athlete of the Week is Calista Wold. The Girls 8A team was short players this week, but Calista gave it her all to help the team dominate over Sacred Heart. Congratulations Calista, enjoy your trip to “the Beach”! From the Saints Sidelines . . . Our Saints didn’t let a little snow sideline their games this weekend. Bringing home wins this week were – Girls 5A, 5B, and 8A; Boys 5A, 7A, 7B1, 7B2 and 8B1. We are over half way through the season, and current league standings show many of our teams leading the ranks. Currently sitting in 1st place are Boys 7B2 and Girls 5B. Holding strong in 2nd place standings are Girls 8A, Boys 7B1 and 8B1. Keep up the good work Saints! Be sure to check the league website at http://www.dplbba.org for league standings and schedules. Remember to pick up a new ASCA basketball car decal and show your team spirit! SHOUT-OUTS now available! Does your athlete have a birthday to celebrate? Do you want to recognize your son/daughter’s team or your son/daughter for their academic/athletic performance? SHOUT-OUTS are now available for $25 through the Athletic Association. Shout-outs will be placed on the digital scorekeeper’s table at all HOME games for one weekend. Be sure to purchase a shout-out to recognize your child’s special moment! Contact Keith Glab at kglab@ascacademy.org. There is still time to show your team pride by placing a SAINTLY SPOT in the DDA booklet. Submission deadlines are due by tomorrow, Friday, January 18th. For further information, contact Catherine Chen at chenxcatherine@gmail.com. Stay Calm and Dribble On!!! YOU COULD BE A SPONSOR OF THIS YEAR'S DDA!